Elevation maps are the images that you see on the contour lines in a topographic map. Contour lines are distinct characteristics of a topographic map. It defines the line drawn on a map, which connects the differences in elevation of the Earth's surface. A topographic map is a two-dimensional illustration of a portion of the three-dimensional surface of the earth. It exists to represent the earth's land surface. Topo maps use contour lines to calculate the height of mountains, depths of the ocean bottom and steepness of slopes. These are imaginary lines, which join the inclination of the surface of the land above or below. If you cross a path in the elevation map, you are either climbing or descending. The difference in elevation between adjacent contour lines is called contour interval, which shows the natural shape of the terrain. A shaded relief added to a topographic map makes the landscapes easier to visualize. Shaded relief or hill shading imitates the shadow thrown upon an elevation map or more precisely, upon the earth's surface that the topo map represents. 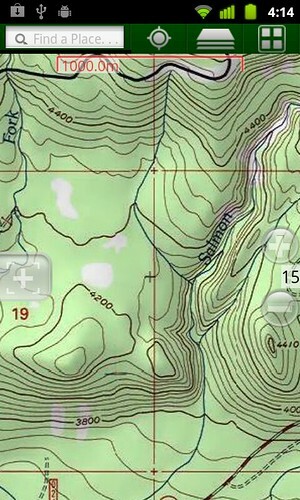 Here is a preview of BackCountry Navigator topo map. Geological studies use the configuration of the earth’s surface through topographic maps. Cartographers use the three-dimensional elevation map presentation on a flat piece of paper by using contour lines. It is through topographic map that horizontal distances and vertical elevations are measured. Topographic maps benefits hikers, campers, military, architects and mining companies on their activities by giving them an accurate guide or representation of their location. Understanding elevation maps and recognizing the map symbols will greatly lessen the obstacles along the way. BackCountry Navigator uses the most easy to understand and updated topo maps for your GPS devices. Its commitment to provide a reliable source for navigation is very important. Be safe in the outdoors.